Is URI: The Surgical Strike Worth Watching? In September 2016, four heavily armed militants attacked the Indian Army brigade headquarters in Uri in Jammu and Kashmir near the LOC. Nineteen soldiers of the Indian Army were martyred in the attack that came to be known as the deadliest attack till date. A lot many soldiers were brutally injured. Even though all four militants were killed in the combat that lasted for six hours, the areas along the LOC were put on Red alert and the security was tightened. Uri attack happened in the same timeline after Gurdaspur attack in July 2015 and the attack on the Pathankot Air Force Station in January 2016. This forced the Indian Army to retaliate because ‘they did not start the war, but they bloody hell wanted to finish it’. Pakistan refuted all the allegations put on them and issued a statement saying that India has a ‘habit to blame’. On September 29, 2016, eleven days after the Uri attack, the Indian Army declared that they had given the terrorists a taste of their own medicine by eliminating 7 launch pads in Pakistan Occupied Kashmir (PoK). Calling it self-defence against the future attacks that might happen in Jammu and Kashmir, the Indian soldiers fought tooth and nail and avenged their brothers. This heart-wrenching news scared the nation at large but the counter-attack and the reply by our soldiers helped us all to heave a sigh of relief. With time, the attack and the intensity of the loss were forgotten. Most of us didn’t even get to know the dynamics of the surgical strike. But it is never too late to learn, isn’t it? It is not wrong to say that life is filled with infinite possibilities and when one decides to explore all avenues, the result is always satisfactory. From the past two years, Bollywood has been on the ball to focus more on content and context and not on grandiloquent star cast and clichéd shallow plots. With several offbeat films hitting the silver screen last year like Badhai Ho, Stree, Andhadhunn, Tumbbad, Padman, Parmanu, Mulk and Raazi, the directors hit the bull’s eye by getting the due attention of the audience. Most of the movies centred on the people who do the thankless job of safeguarding our borders. These movies did not fail in spreading awareness and generating patriotism within the hearts of many. As the year wrapped up, the most awaited release of 2019 came into the news and the three most common words that became associated with this movie were- propaganda, jingoism and hyper-nationalism. With fame comes a lot of criticism as well and Uri was no different. On the day of the release itself, the critics started associating the movie with ‘political agenda’. Some of the critics said that Uri’s motive was to glorify the Prime Minister as Surgical strike was one of the talking points that also became the mainstay of his tenure. Some accused the film of promoting jingoism because according to them the dialogues like ”उन्हें कश्मीर चाहिए और हमें उनका सिर”, ”खून का बलदा खून से लेने का वक्त आ गया है” and ”अपनी 72 हूरों को सलाम कहना, बोलना दावत तैयार रखें हम बहुत सारे मेहमान भेज रहे हैं” can sweep the audience into developing extreme or aggressive patriotism. But isn’t a war-movie supposed to evoke patriotism? Even Vicky Kaushal clarified on many instances that the viewers are expected to watch the film from a larger perspective and understand the need of the situation. Dialogues with lesser energy wouldn’t have helped in lifting the josh of the commandos because they were being prepped up for a mission that did not guarantee their safe return. Under such disquieting circumstances, it is imperative to have a clear conscience so that not even one commando flinches when it is time to play the dirty game! Here are a few pros and cons that I believe will help the viewers decide whether Uri is a good bet or not! The actual mission was executed on foot but the movie uses choppers disguised in the colour of Pakistani Helicopters for the mission. Considering the fact that the movie is just ‘based on true events’, I think this much of creative liberty is allowed. If everything was shown like how it was executed in reality, then we all would have had problem with Bollywood’s lack of originality in ideas, isn’t it? We should not forget that by the end of the day, it is a commercial movie and not a documentary. The movie showcases a young intern who builds ‘Garuda- a bird drone’ as a means to pass time at the Defense Research and Developmental Organization. His idea forms the substitute for the Recon team (that is trained to keep surveillance on the enemy launch pads for 24 hours and record every movement of theirs) and is used by the army to locate the coordinates of the enemy’s launch pads. I think the director should have gone ahead with the concept of Reiki as that would have added to the intensity and tension of the plot. 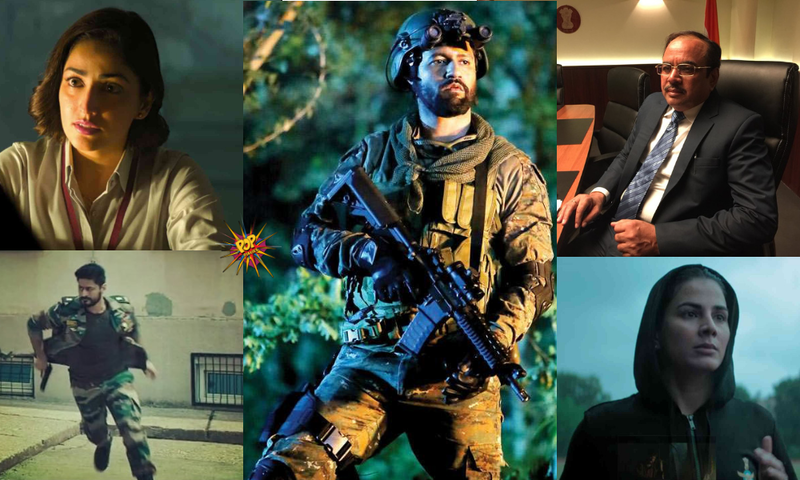 Even though the cast of Uri has the required adrenaline rush and oozes with patriotic fervour, the director introduces some very avoidable elements that have left people ranting and raving about the same. For an instance, the protagonist’s hand-to-hand combat with the leaders of the terrorist groups is something that is not palatable. Even if this part was not there, the director’s intention of paying a tribute to the country’s heroes would not have gone in vain. Uri started drawing fire even before it was released. But without a doubt, this movie is one of the best war movies ever made as it portrays the real emotions an army man goes through. Right from angst, hate, disgust, guilt and sorrow to love, happiness, joy, hope and fear- Uri has it all. It is a tribute to the men in uniform who endure so much just to keep us all safe. There have been war movies before that had a strong emotional narrative. But Uri surpasses all those movies as its USP is the sincerity with which the director, Aditya Dhar, has thrown light on what happens in a battlefield in reality. The conception, planning, decision making and execution- all form the essence of the plot. Rather than burdening the actors with a baggage of emotions, the director ensures that nobody loses the thread and the theme of the movie is kept intact. He delivers a candid but different war experience that leaves the audience proud and injects in them a feeling of nationalism and patriotism. 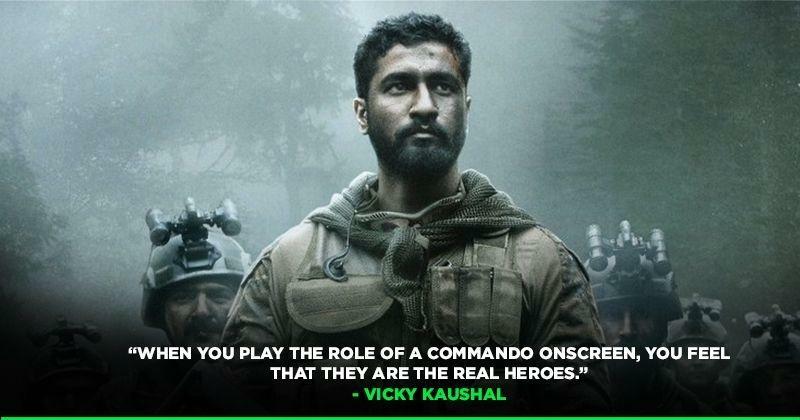 If not for anything else, watch Uri for Vicky Kaushal. The man has proved himself last year by doing varied roles and giving his best. 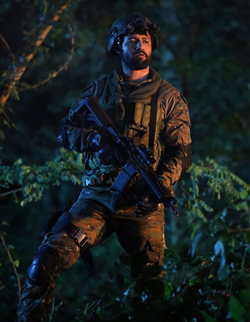 As Major Vihaan Shergill, Kaushal’s grit and determination are evident. His agility, physique and stance do justice to the role and help him deliver a sedate performance. Uri has a strong star cast as all the performances are up to the mark and pass the necessary muster. Yami Gautam, Kirti Kulhari, Paresh Rawal, Mansi Parekh, Rajit Kapur and Mohit Raina- all of them have put in efforts that cannot go unappreciated. Amongst them, Mohit Raina as Capt. Karan Kashyap stands out and leaves an indelible impact on the minds of the viewers. The movie lacks any love plots and that is the best part. With almost no sentimental songs or exaggerated moments of sorrow or happiness, the background score is suitable and builds up the apprehension. The sounds of the bullets, rocket launchers and the missiles are just enough to give goosebumps. Shots are perfect. Aerial views are not only clear but aptly placed. Running shots, training sequences and scene transitions- everything is top notch. Even though the proximity of this movie with the nearing elections and the amount of screen time that the characters played by Paresh Rawal and Rajit Kapur get might make you suspicious of the purpose of the film, the genuine sincerity with which the story has been executed will make you realize its real purpose. Uri is a tribute to the Indian Army. Uri is the first content-based film of 2019 and I can safely deduce that it is neither propaganda nor a film that promotes jingoism. But yes, it has the calibre to instil nationalism (not hyper) which is the need of the hour. It rightly shows what goes into the making of a superhero and what all it takes to serve the nation. Rather than just being an armchair critic, it is wiser to grow up and appreciate the efforts put by the cast and crew of Uri. Not everything has to be scrutinized with so much dexterity! Why not watch the documentary for knowledge upgradation? Uri is just a film- a form of art that pays tribute to those who lost life for our sake. Let us respect that and salute the bravehearts!